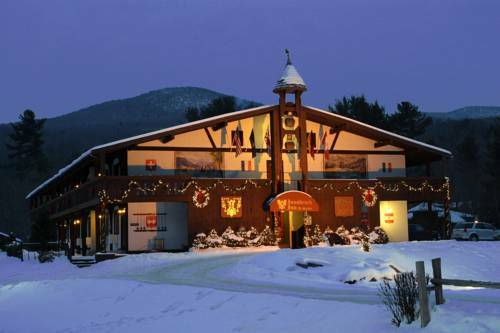 An intimate and distinctive resort inn nestled beneath Vermonts highest peak The Innsbruck Inn at Stowe combines the atmosphere and style of a classic European alpine inn with spacious accommodations and modern amenities of a quality mountain resort. Located only 1.5 miles 2.4 km from the base of majestic Mount Mansfield and the world renowned Stowe Mountain Resort Ski Area the inn is situated on a scenic Mountain View property in the heart of Stowe rural tourist district 3.2 miles 5.14km from the historic Village of Stowe and bordered by the crystal clear West Branch River that descends from Mt. Mansfield. The property features manicured lawns flower gardens and a peaceful stream side park with shading maple trees and relaxing Adirondack chairs. The property also highlights a covered bridge at its border and direct access to Stowe excellent 5.3 mile 8.5 km Recreation Path. The path which winds its way to the village through meadows tree lined park areas and over 10 bridges along the West Branch is ideal for walking jogging biking and Nordic skiing. Accommodations include spacious Hotel Guest Rooms 375 sq. ft and Efficiency Suites 525850 sq. ft. with popular amenities including bathrobes living room seating coffee makers refrigerators 20 mg WiFi internet service plus interior hallway and exterior balcony or driveup entrances. A classic 5 bedroom 2 bath Alpine Guest House is also available. Amenities include a spa room with whirlpool spa Swedish sauna and exercise equipment plus two inviting outdoor spas situated on a beautiful stone terrace heated outdoor pool lighted paddle tennis court bicycles direct access to hiking and fishing sports field volleyball basketball children playground. In winter a lighted skating rink Nordic and snowshoe access trail kiddies sliding slope.